Ultimately my job is about relationships. To gain your trust and recommendation is my goal. I am committed to providing the best service to you, whether it is the first or tenth time. John Carrillo is now an RV Mobile Authorized Service Center/Dealer for Aqua-Hot Heating Systems. John also specializes in the DBW 2010 & 2020 Webasto Thermosystems. John Carrillo is a former employee of Aqua-Hot Heating Systems with over 17 years of experience in the industry. John Carrillo Hydronic Heating Specialist services and repairs all models of Aqua Hot, Hydro Hot, and Webasto heating units. John Carrillo Hydronic Heating Specialist provides same day technical support on all Aqua Hot parts, Hydro Hot parts, and Webasto parts. We are here to help guide you and answer any questions you may regarding parts and service. 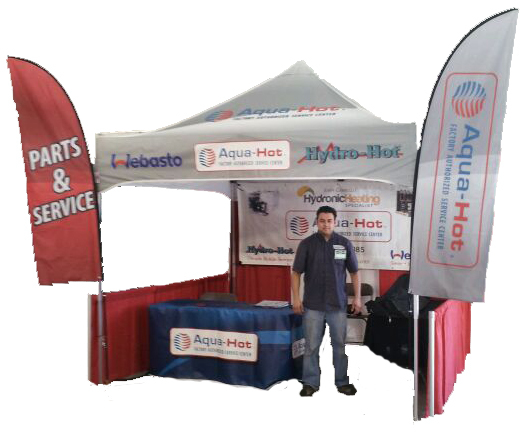 John Carrillo Hydronic Heating Specialist provides service and repair on Aqua Hot, Hydro Hot, and Webasto heating systems at RV Rallys, RV shows, and On-site locations. The services are provided at FMCA National, FMCA Area Rally’s, and Good Sam rally’s. Visit our online parts store for your Aqua Hot parts, Hydro Hot parts, and Webasto parts and supplies. If you need help locating a product, use the navigation menu to select to proper category. If you still can’t find what you need, contact us and we will be happy to assist you.